Pope Francis communicated more with one hand than many in the audience had seen in a long time from a church leader. “What works for the hearing community doesn’t always ‘fit’ the deaf community and vice versa,” he said. By incorporating deaf Catholics into parish life, the entire community is enriched. Father Carey said that by incorporating deaf Catholics into parish life, the entire community is enriched. 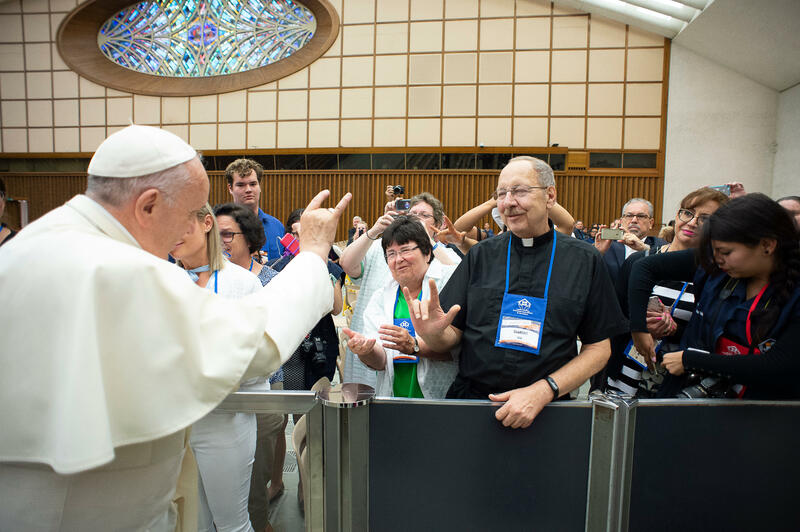 While many Catholics may have experienced Mass being celebrated by a hearing priest with an interpreter for the deaf community, Father Carey celebrates Mass and preaches using American Sign Language, with a voice interpreter for those who hear. He said hearing parishioners have come up to him after to say how powerful the experience was for them. This is an instructive article that demonstrates for how long we who are sighted and hearing have not “seen nor heard” our own who are disabled. The disabled, and their parents, families, and caregivers, languish, except in rare instances, without outreach from us. There is a place here for the laity to become ministers of the Gospel that clergy are unable to fulfill. Will the clericalism in so many dioceses cause intransigence on the issue? Thank you for this article. As a Catholic who is a vocational rehabilitation counselor, I am well-versed (pun intended) in Deaf Culture and the need for more inclusion in all spheres of communal life, including our Church. One thing that this magazine could do without any expertise (other than keyboarding) is to provide transcripts of posted videos such as the one at the end of this article. Deaf Catholic Youth Initiative for the Americas is doing fine. This article also appeared in print, under the headline "For deaf Catholics, a gesture from Pope Francis meant the world," in the August 6, 2018 issue.